Black Friday is around the corner and every internet product and service provider has started offering huge discounts. This is the most awaited time of the year, and I personally have made a huge list of blogging products I would be buying this Black Friday. If you want to start a blog or grow your online business to a higher level then Black Friday is the perfect time to do so. You’ll get best offers from top sites for a limited period. Don’t miss out and take the full benefit of these deals. I’m categorizing this post into different categories so you can directly scroll to the one of your interest. Let’s get started. Below are the top web hosting deals you can avail during Cyber Monday and Black Friday 2017. When it comes to providing amazing performance and quality web hosting, it’s hard to beat SiteGround. It boats features like SSD storage, fastest website setup, free migration, free domain name, and a lot more. Similar to last year, SiteGround is again giving a huge discount of 70% OFF on all shared web hosting plans. The sale will go live on Friday, 24th November 2017, 00:00 AM, CET and it will end on Tuesday, November 28, 2017 at 09:00 A.M, CET. That’s a 4-day long crazy sale. There’s no coupon code required and you’ll get more details about the sale on their homepage. Our blog (blogcharge.com) is powered by InterServer and I couldn’t be more happier with the quality of service I’ve received. Of course there were some glitches but the support team managed to solve them ASAP thanks to their technical experience. There’s only 1 shared hosting plan priced at $5/month which lets you host unlimited domain names. You also get SSD-storage, free website transfer, unlimited storage, and free SSL certificates powered by Let’s Encrypt. They also provide managed WordPress hosting plan priced at $8/month which gives you better security and faster speed for 1 domain only. Apart from it, you can buy VPS, Cloud hosting, Dedicated servers, and Reseller hosting from InterServer. Make sure to check out my review of InterServer. Enjoy FLAT 50% OFF on unlimited web hosting. It’s a lifetime discount meaning your hosting will renew at just $2.5/month for as long as you’re with them. The offer is live now and valid until 27th November 2017. If you’ve a decent budget and need superior quality web hosting then WPX hosting is the best your money can buy. During my inspection, I’ve heard nothing but good about their service. The base plan starts at $24.99/month which allows you to host up to 5 domains with 50 GB bandwidth limit. You get free migration, 99.95% uptime guarantee, insane load speed, and amazing customer support. The customer support don’t just gives you link to knowledge base but actually fixes the issues. WPX is hosting an amazing never seen Black Friday and Cyber Monday discounts. If you’re subscribing for 2-years, you enjoy double the benefits on all plan. For instance, you get double website slots, disk space and bandwidth. The plan is valid for all users (existing and new) but there are no additional discounts available. Furthermore, if you decide to renew your plan on a 2-year basis, you get to enjoy ‘Double Dealio’ forever. If you prefer not to buy for long term, you can enjoy 3 FREE Months on buying any annual plan. You don’t get double the benefits, but this deal will bring down your hosting expense to just $19.99/month. Similar to previous offer, this offer is also valid for existing WPX customers. If you just want to give a try to WPX hosting, there’s an special plan for you. Now you can host your site for just $1 for the first month and pay regularly after that. It’s perfect if you just want to test how well their service is before committing yourself. It only applies to new customers of WPX hosting. HostGator is one of the top entry-level hosting provider available in the market. It caters to small bloggers who are just getting started or have minimal traffic. The hosting quality is good and you get close to 99.99% uptime guarantee. You also get access to unmetered bandwidth and SSD storage on all plans. There’s no free domain included but they do provide discounts on domain names. HostGator is expected to provide huge discounts of up to 80% OFF on existing prices. HostGator’s Black Friday will go live on 23rd November until 28th November 2017. A2Hosting is another well-known hosting provider that supports SSD-storage. Although not cheapest, it provides a very good quality and load time. The lite plan is somewhat mediocre, but TURBO plan is better than the industry standards. Coupled with Turbo technology and A2 accelerator, it makes your site fly. You get free SSL certificates and unlimited storage on all plans. Also, free migration to A2Hosting is another noteworthy feature. However, there’s no free domain name included and you need to pay extra to get priority support. Apart from shared web hosting, A2Hosting also provides VPS, Cloud, and Reseller Hosting. Unlike others, there’s a site wide discount. You can grab huge discounts on shared hosting, cloud hosting, VPS, and re-seller hosting. The A2Hosting Black Friday sale will go live on 00:00 AM, 23rd November 2017 until 11:59 PM, 27th November 2017 CST. Below are more details about the sale and discount coupons you need while purchasing. You can enjoy a one-time FLAT 50% OFF discount on all VPS and Managed hosting plans. Apply coupon code “CMVPS” while check out. If you are a reseller and want to buy best-quality reseller plan, enjoy a flat 40% OFF discount. Use coupon code “RSL40” on your cart. BlueHost is yet another entry-level web hosting provider and quite popular among new bloggers. It provides one of the cheapest web hosting plans with decent features. Their plan starts at just $3.95/month which allows you to host 1 website. Installing WordPress is easy and takes no more than 2 minutes. You also enjoy 1 free domain name, unmetered bandwidth, and Free SSL on all domains. However, customer support is not up to the quality and you might face delays in getting support. The secret sale will go live the day after Thanksgiving this year. We expect discounts around 67% on shared hosting but that’s yet to be seen. Claiming the title of cheapest web hosting provider, iPage is good for beginners who just need a personal blog with minimum traffic. The quality of hosting is decent and it can manage small traffic without glitches. The pricing starts from just $1.99/month with a FREE domain name. Customer support is decent and they can fix small problems quite fast. However make sure to read every option and evaluate every ticks before you buy iPage hosting as they’re known to oversell products. Read my iPage review for more details. iPage is pretty cheap in itself but you can save more with Black Friday deals. Cloudways is a dream come true for those who need to host their site on Cloud but don’t want to deal with the technical part. Technically, CloudWays is not a web hosting provider itself, rather it host your site on cloud server from DigitalOcean, Amazon, Vultr, Linode, etc. The advantages is that you no longer need to deal with technical part of setting up your site, installing SSL, migration, and others. Everything can be managed by intuitive control panel provided by CloudWays. You also get superior 24/7 customer support which is often missing from cloud providers. Since they actually host your site on other cloud providers and manage it, the prices are higher than usual. The DigitalOcean plan starts at $7/month and can be scaled based on requirements. Last year we saw a minimal Black Friday discount of just 25% OFF on 3 months plan. That seems legit as they aren’t the actual providers and hence need to pay the hosting fee themselves. This Black Friday you get $150 free credits but there’s a catch. You get 10% deducted from those $150 credits for further renewals. Another entry-level hosting provider with decent quality and affordable price tag. FastComet is a good option for those looking to start a blog with SSD-powered web host with servers at different locations. Another interesting feature is you get “One FREE domain name for life” with every plan. Also, there’s a price-lock guarantee, which means you need to to pay extra price on renewal. FastComet Black Friday sale will go live on Wednesday, November 22th 6:00 A.M. EST and will be live up to Tuesday, November 28th 6:00 A.M. EST. You get an amazing 30% OFF on all shared hosting packages & cloud VPS/Dedicated server plans. You also get up to 85% OFF on selected domains throughout the six-days of sale. If you were looking to get your hands on some beautiful WordPress themes and functional plugins, here’s your chance. The list below contains best deals on top WordPress products. MyThemeShop has been my all-time favorite store for buying SEO-optimized WordPress themes and plugins. They have created some of the fastest WordPress themes like Schema that alone shows how talented their coders are. The cost is also pocket-friendly and worth the money spent. A regular theme costs around $69/year whereas a plugin starts from $29/year. You get to use it on unlimited sites you own and with excellent customer support. Similar to other sales MyThemeShop run throughout a year where you can get any theme/plugin for just $19/year, I expect to get the same or even better this Black Friday. Currently only their latest theme “WP Real Estate Pro” is available at $19 which has a regular price of $89. Theme-Stop is not a very popular name but they have some good quality themes available. There are over 25 premium themes available and some of the looks really cool. You can’t buy a single theme but the yearly subscription cost just $69/year which is insanely cheap. Lifetime membership costs $249 (one-time fee) which gives access to all the current themes and future updates. The pricing is already very cheap but Black Friday sweetens the deal. You can get FLAT 60% discount on all plans. The offer is live now and valid until Tuesday 28th November, 2017. Use coupon code “HOLIDAY60” to bring down the yearly membership price to just $27. That’s roughly $1/theme. If you want to start a niche site which is focused on Conversion there is no better option than Thrive Themes. They have the best converting themes and combined with their plugins, you can seriously turn your site into a conversion machine. They don’t have a huge collection of themes but with the help of Thrive Architect you can design any kind of website without touching a line of code. Thrive Leads is another amazing plugin for collecting leads. It actually seems that Thrive Themes are against all these Black Friday mellow-drama. Similar to last year, they aren’t providing any discount on their plans. But there’s a catch. Instead of giving away discounts, they will donate 50% of all Black Friday income to KIVA, a non-profit organization that helps people in need get micro-loans so that they can start their own businesses. That’s an appreciable move. Well done team! Even if you live under a stone, you would have heard of the amazing Divi Builder theme. Elegant theme developed it and today it proudly stands among best multipurpose themes. The yearly membership plan costs just $89 per year with access to all themes and plugins + future updates. There’s also a Lifetime subscription option available at a one time fee of $249. There’ll be a site-wide 25% discount this Black Friday. However whether you need to use a coupon or it will be a direct offer is yet to be known. Theme-Junkie is another popular WordPress themes provider. They have a huge collection of 55+ themes and the prices couldn’t get better. You can get access to all of them for just $49 on a yearly basis and $99 for lifetime. One of my personal favorite is Beginner theme which comes with a separate deal section. Enjoy FLAT 30% discount on all plans. Use coupon code “SAVE30” during checkout. Visualmodo is yet another underdog of WordPress themes provider. I recently got to know about them from a friend. They have some amazing multi-purpose WordPress themes and they keep popping new one’s regularly. You can find a cool theme for every category of business. Along with the theme, you get Visual Composer ($34), Ultimate Add-ons for Visual Composer ($20), and Revolution Slider ($25) for FREE. Enjoy FLAT 50% OFF on yearly membership. You get to use these themes on unlimited domains, and free access to future updates. Use coupon code “WEBDESIGN” during checkout. It’ll cost you just $49.50 for all 19 Themes and free goodies mentioned above. What’s better than improving your SEO and ranking on the first page of Google? Well, now you can accomplish it by making use of best SEO tools in the industry. Here are all the SEO tools on sale this Black Friday. SEMRush is one of my favorite SEO tools with tons of features combined under a single dashboard. It helps me evaluate my site, keep track of keyword rankings, evaluate keywords difficulty, analyze my competitors, and a lot more. You can try SEMRush Pro plan (priced at $99) for 2 Weeks for FREE. If you ask me what’s the best keyword research tool to find low competition keywords within minutes – my only response will be Long Tail Pro. It has a huge database and the results are more accurate when compared with other tools like SEMRush. This Black Friday, enjoy flat 50% discount on all plans (starter and pro) for lifetime. It means you need not to pay a higher price on renewal. There are few products on sale which do not fit into above categories but are definitely helpful for bloggers. So, here’s a list of miscellaneous products on sale. Content Delivery Network (CDN) helps you super-fast your site’s loading time. A CDN network will store your site information on different locations throughout the world. Whenever a user requests your site, a CDN will deliver the site from nearest location for best performance. MaxCDN is one of the best CDN provider and leads the market. The pricing starts from just $9/month for bloggers and small entrepreneurs. Enjoy FLAT 25% discount and more. Will update as I get to know more. NameCheap is one of the largest domain name registrar and also a popular web hosting provider. It is a perfect place for beginners to buy a domain name and host it for a fraction of cost. They also provide SSL certificates and private emails. 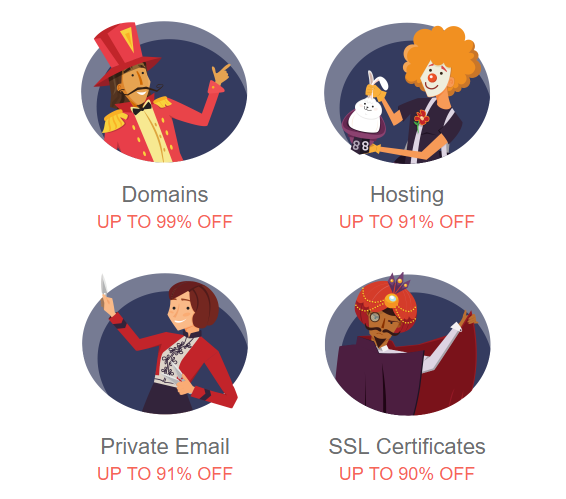 NameCheap is giving up to 99% discounts on domains and amazing discounts on other products as well. Refer to below graphic for offer details. The offer will be live from Friday, 24th November. Also, you have 2-days to checkout for any product you add in your cart. Envato market is a huge marketplace of some of the best selling themes, plugins, graphics, and more. Buy 500 items mentioned on the deal page for FLAT 50% OFF. Also, you can subscribe to annual subscription and download 4,00,000+ items with up to 34% savings at an effective price of $19/month. The offer is live now. Friendly Reminder I'll keep updating the post as soon as I get information about more deals. Bookmark this page and stay tuned. I hope you enjoyed the above list. If I have missed any of your favorite product, do let me know. Know someone who would benefit from these deals? Don’t be mean and share this post with your best friends and followers. Affilate Disclosure Links in this page may contain affiliate tags which means I will get a little commission (at no extra cost to you) if you decide to buy any product.